Coach Barnett and Coach Rayford along with one of the varsity players signings, 2015. Lake Effect's Mitch Teich speaking with former Warning League players, Brian Garner, Todd Barnett, and Calvin Rayford. For the past couple of weeks, our Precious Lives series has reported on a Milwaukee summer recreational basketball league. We’ve learned how the Warning League, as it’s known, has been affected by gun violence, and how it has served as a stabilizing force for young people. 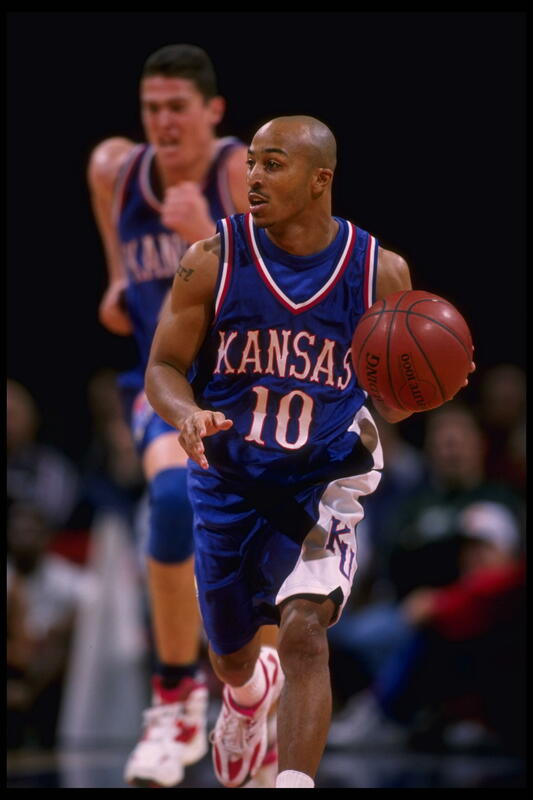 Guard Calvin Rayford #10 of the Kansas Jayhawks takes the ball to the hoop of the Virginia Cavaliers at The Palace in Auburn Hills, Michigan in the Great eight tournament in 1995. Warning has a long history of touching lives and turning aspiring basketball players into stars on and off the court, like Calvin Rayford. He was Wisconsin's "Mister Basketball" in 1991, and went on to play for the University of Kansas, which reached the Final Four while he was playing in 1993. Like now, when Rayford was playing with the Warning League it was about more than just basketball. After leaving the league for college, he and his fellow teammates maintained relationships with the coaches. If they had problems with school, friends, or family, they knew they could turn to their former coaches for help. "We called them, we talked to them and they gave us the best advice so we can move on," he says. "The best players in the country at that time... were the guys that I would play against in the summer time." Brian Garner also played for the Warning League, before heading to the University of Iowa, a Big Ten school. He says that even after going to college, he would come back to the city to play with people in Milwaukee. In fact, he would routinely miss the first three games of the season to keep playing in the summer. "The best players in the country at that time, because we didn't have AAU, were the guys that I would play against in the summer time," says Garner. "Those were the guys who weren't eligible, those were the guys that didn't have anything to lose. Those were the guys that during the season, would come cheer for us and make sure that we did the right things. So it was a barometer to judge where you were in the basketball community in the city." "We've got a saying, 'If you can't make it where you from, you can't make it where you trying to go.'" It was these community ties that brought both Garner and Rayford back to the city. Along with Todd Barnett - another former player who went on to play with Wyoming - they have returned to Milwaukee as teachers and coaches, working with a new generation of kids in Milwaukee's inner city. "We've got a saying, 'If you can't make it where you from, you can't make it where you trying to go,'" says Barnett. 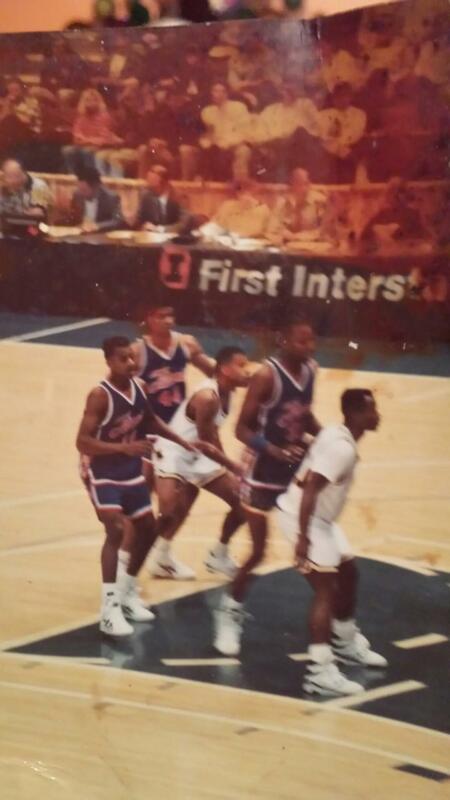 Todd Barnett playing in the Casper shootout in 1990 his junior year for the University of Wyoming, taking on Cal Fullerton and Cedric Ceballos. The group agrees that playing in the Warning League was unlike anything they experienced in college. "I was playing... against the best of the best," says Rayford. "I don't think a lot of states and cities give Milwaukee a lot of credit. We have a lot of good basketball players come out of Milwaukee, Wisconsin. And that time and that era in late 80s, or early 80s, early 90s - when you went to a park you had to play somebody. You had to be for real or they was gonna embarrass you." "When you know what you want to be and you know that you want to be one of those people one day that everybody's gonna watch on that playground, when the lights go off, you're still bouncing that ball." These weren't your average high school basketball games, either. Basketball courts would be crowded with people from the neighborhood, leaning through chainlink fences, stretching to get a better view. The players were neighborhood celebrities, and kids would come up for autographs after the game. All three men say that getting into the league was something they had to really work for. In a chorus of "practice, practice, practice," the men agree that getting into the Warning League was something that required great dedication and determination. "When you know what you want to be and you know that you want to be one of those people one day that everybody's gonna watch on that playground, when the lights go off, you're still bouncing that ball and shooting that ball to get yourself better and make yourself better," says Garner. Calvin Rayford coaching his players. Coach held in his tears after years after his best friend and basketball teammate John Wess was killed back when they were teenagers. That trauma had major consequences on Coach - there was prison time, suicidal thoughts and more violence. But, he was able to turn things around. If you are between the ages of eight and 48, love basketball and live in Milwaukee’s central city…you’ve probably been a part of Warning’s basketball league. Over 40 years old, the Warning basketball league is the third oldest in the nation. It’s a rite of passage, and for many youth, it’s the place to be over the summer, wearing the colored t-shirt representing your team. But last year was a rough year for the league. Two players died within the first week - Tariq Akbar, 14 and Giovonnie Cameron, 13. Both were fatally shot.